For any adventurous traveller living in the Gulf, a journey overland to Salalah in the Sultanate of Oman must be high on the list of must-do trips. It's therefore amazing that after a combined total of 38 adventurous years in the UAE, Liz and I had never made the trip. Salalah had always been on our to-do list, but somehow we'd never got round to going. Early in October 2002 we decided to change all that and put it firmly at the top of the list. As usual with us, it was a spur of the moment decision and was organised in a very short time over a bottle of plonk. We knew that we needed a reliable vehicle, and it had been one of the excuses we'd used when debating whether or not to renew our ageing Nissan 4WD; so having decided to trade the old Patrol for a new one, I suppose we were committed from that point on. First, a bit of background - Salalah is at the southernmost bit of Oman in the Dhofar region just before you get to Yemen. It's quite a large place with a population of around 150,000, and is considered the second city after Muscat. It reminds me a little bit of Fujairah, with it flat coastal plane backed by mountains. 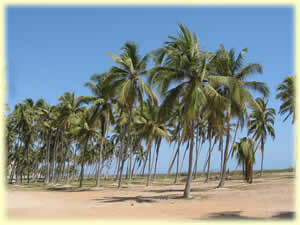 Salalah is also where the ruler HE Sultan Qaboos was born. The place is especially renowned for its climate because it catches the monsoon which results in cooler summer temperatures, and hills covered in lush green grass and bushes. The road to Salalah has a reputation. It's a road of legend, and anyone who's made the journey will have some story to tell. Two things make the road to Salalah different; one its length, at about 1000km, (depending on where you start), and two, its remote nature. You travel for long intervals without seeing another vehicle, without a change of scenery, and without any signs of habitation. 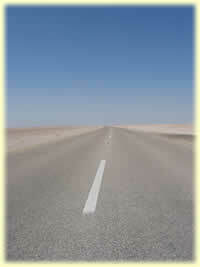 Many people say that the long journey is boring and monotonous, but we didn't find it so. I'd have no hesitation in doing the drive down there again. Of course the road these days is paved all the way, and some people will reminisce nostalgically about the 'good old days', when you had to drive on a graded track. My response to them is that if you feel that you miss the graded track you can still drive on it as it runs alongside the new road! I suspect there won't be many takers. We had about eight days for our trip, and covered 4,500 kilometres. We would never have seen and done so much if we'd had to drive much of that on graded tracks. The only times we didn't have a paved road was on some of the coastal trips and mountain trips around Salalah, some of the roads that we used to get over to the coast from Haima, most of the roads on Masirah Island, and on many of the side trips we made on our way back. Another luxury on the road are the frequent modern petrol stations that have been built, again the old timers can still use the old shacks with the hand pumped petrol from oil drums if they want, but the new stations are sited at regular intervals. Our vehicle is fitted with a sub-tank giving us a range of nearly 600km, but although it was nice to have the extra fuel for peace of mind, we never had to use it. Left for Oman after work; got away at 1pm. Entered Oman via Mezyad (Jebel Hafeet) border, and reached Nizwa just as it was getting dark. Decided to drive on and find a rest house. Eventually drove on nearly reaching Haima, but decided to camp just off the road. Slept in the car and once I got comfortable, had a surprisingly good night. Liz had been on night duty Wednesday so was really tired. Set off very early in the morning at just before 7am. Topped up with petrol and had a good journey all the way through to Salalah, arriving at about midday. We just had to stop off on the way in the fantastic green hills above Salalah; it was such a contrast to the barren landscape that we'd passed on the way. The greenery starts very abruptly, and although we were told about it, it was so outstanding that it still came as a bit of a shock. There were plenty of birds around ponds, cows and camels wandering through the fields, and the weather was just perfect. The sun was hot but the air was fairly cool. Went to the Holiday Inn and picked up maps, and then went onto the nearby Salalah Beach Villas that the guy on the desk had recommended. We liked the apartment, but decided to check out the Mughsail Cabins before making a final decision. Mughsail cabins were full but we made an advance booking for Saturday and Sunday night. Returned to Salalah and checked into Salalah apartment. Apartment was very nice with double bed, sitting room, bathroom, and kitchen. There was also a swimming pool in front of the building. The rate was 24 OR including breakfast. Had a leisurely stroll along the beach watching the local people doing the same, and the lads playing football (many wearing Arsenal shirts). Only problem was security for the car. We were told stories of cars being broken into and of recent hi-jackings. We ended up staying up all night doing watches!! Nice sunrise. No problems. Had the king coconuts which we'd bought, and then went down for a nice breakfast by the pool. Packed up and left to do some bird watching at the eastern Khawr. We saw plenty of seabirds and waders. Next we went on to Jobe's tomb. Met a couple from Muscat, and had a chat. Went in search of Frankincense trees, and then stopped for a picnic under a tree. In these parts there are many tracks leading off the road to shady picnic spots under the many trees, and the novelty of having a picnic on the grass was just brilliant. Drove to Mughsail and then on up the coast on the way to Rakyat and the Yemeni border. Drove on incredible mountain passes, through the police post and then when the light started to fade turned back to Mughsail, arriving at about 5pm. Checked into cabin and had a meal of fish lobster and prawns. The food was very good and there was excellent coffee to follow. The cabins are 'ethnic' but fine. The car had its own little barasti house, but manoeuvring a large 4wd into it was a challenge. Had some supper and watched CNN before turning in early. Had a bit of a lie-in and then went for a walk along the beach before making our way to the Khors just up the road. When we drove onto the main-road on our way out we saw a Lanner Falcon on the wires; the first of many falcon that we saw that day. Drove to Khor Taqah and toured the mangroves and reed beds. Saw an Isabelline Shrike, and Gull-billed Tern, as well as many other waders and flamingos. Drove through the small town and then on to the beautiful Khor Rauri. Here we saw Ferruginous ducks, many Heron, and swifts. This is a seriously wonderful spot. The Khor is very long and still full of water. There were some other birders here at the same time as us. We next continued on to Mirbat which is an ancient port. This is a very interesting old town, now mainly deserted for the new development. We had lunch at the Shara Tourist Restaurant. Whale Skull and bones in the entrance, and a large patio on the headland where we had orange juice and a mixed platter of onion spiced fish. Limpets, abalone, lobster, squid, octopus, all done in a curry and onion flavoured sauce. We watched the Sooty Terns on the nearby rocks and the well restored fort just across the bay. This restaurant makes a great place for a stop, and the food is good too. From Mirbat we went back to Khor Rauri and found our way to the other end of the Khor where we could see the point where it nearly meets the sea, and also the archaeological site Samurhan (reputed to have been the Queen of Sheba's Palace). Next on the agenda was a drive up the mountains to Tawi Atayr, the site of a sink-hole. This is a very impressive sink hole over a vast area. Saw an African Paradise Fly-Catcher (female), on the way down to the rim, and started getting bitten by mosquitoes. The wildlife here is amazing and the site is totally unspoiled. There was a cable contraption strung across the hole. On the way back down the mountain to the coast we turned off to Wadi Darbat. This is at the top of a steep precipice, a bit like hidden valley in the Mussandam. The area is flat and lush with some cultivation of bananas and papaya. The road crossed a river and the track was extremely bumpy but thankfully rock hard mud. Driving here must be interesting in the rainy season!! Saw many birds here, including an Eagle, a Grey-Headed Kingfisher, (Liz cried), and a Black-Crowned Tchangra. The people here are Jebali, and live gypsy-like in tents and shacks. We saw a newly born camel. Time was pressing, and after a fantastic nine hour tour of the amazing sites of this area we returned to Mughsail, getting the car washed and picking up some groceries on the way. Sadly a truck had hit a camel along the beach road. Thankfully, no-one was seriously hurt apart from the poor old camel. Liz paid the bill of 30 OR for the two nights' stay. We will try to leave early tomorrow on our way to Masirah. Left Mughsail Guest House at 7:30 am, having settled the bill the night before. Before starting our journey we briefly visited the blow holes, which were blowing but not blowing out water. These were very close to the guest house and just five minutes walk from the car park which was deserted at this time of the morning. By 8am we were on our way back to Salalah and headed up the mountains on to Thumrait. We had to make a quick stop at the top of the escarpment just before the vegetation gave way to the desert once more. We ate bananas and watched some Storks on the hillside. We filled up with petrol at Quitbit and met the same hotel manager we had chatted to on the way down. He was expecting a party of fourteen birders from New Zealand. They'd flown down to Salalah from Muscat. We made a side trip to the sulphurous, smelly springs at Montesar just past Quitbit. We thought we were being followed but we managed to give them the slip. Topped up the tank again at Gaftain where the attendant ran off soon after serving us. We guessed that he'd been watching the cricket match on the TV and we'd disturbed him. On the way to Haima, we turned off right on the PDO black-top road towards Rima. This ended in a roundabout near Rima, where we turned left in the direction of Lapki, and threaded our way through the oilfield road network using the GPS. We eventually found a road that dropped into a vast wadi system and seemed to be heading towards the coast. It was soon obvious that a road was being built through this way, so we followed it. Some of the time we could travel on the newly prepared surface but other times we had to travel on a parallel track which was covered in a fine dust. Eventually we reached the part of the road which had already been surfaced. This road eventually joined the coast road where we turned right to Kalil. Kalil was a lot larger than we'd expected, and we were pleased to find a brand new petrol station at the roundabout leading into the village. The service roads for the station were yet to be built so we had to go off road to get in. We were the subjects of great interest to the locals in battered Landcruisers. We went through the village and on a track to the beach which lead us to the 'Pink Lagoon' which was unfortunately dry, and definitely not pink. On the beach were a walled camping area, and a track which ran along the beach. We turned right and made our way to the Khor which was full of birdlife, including a large colony of flamingos. This track was a bit tricky in places and as time was getting on, and the tide coming in, we took great care not to get stuck. Turning the car around was a challenge in itself, but the sand either side of the track was actually firmer than it looked. We made our way back to the 'Pink Lagoon' and then decided that it would be better to set up camp further back from the beach in amongst the trees. The idea was to be less conspicuous and avoid attracting attention. We headed about 500 metres inland from the beach and found a very comfortable spot. That evening we dined on a mixture of mushroom rice and onion meatballs washed down with a glass of red. We slept safe and sound although we did hear some unidentified animal sounds in the night. The morning was misty and damp, and the tent was soaked, so we took it easy and waited until 9am by which time the sun had dried the tent. The night temperature had been quite comfortable and the morning was cool due to the odd cloud obscuring the sun. Despite our attempt to keep a low profile we were visited twice by local fishermen in their Landcruisers. They seemed to approve of us camping in our little tent. The second pair, a father and son, proudly displayed their catch, which included a small manta ray. We were soon off and heading north along the blacktop road briefly re-tracing our track of the day before. This road was very new and we travelled many kilometres before we came across any road markings, and we soon also came across the crews painting them. Other workmen were fixing rock aprons to the roadsides at the many wadi crossings. There was hardly any traffic, just the odd truck and Landcruiser pickup. After about 100km we turned off right to Wadi Dirif. The point to turn off was marked by two lonely palm trees. We slowly made our way to the freshwater Khor which presented us with an amazing natural scene with camels and donkeys drinking at the water's edge, and a myriad of birds on and around the water. Unfortunately we were soon spotted and the animals moved away. We made our way to the right of the wadi which feeds the Khor and parked the car at the base of the dunes. With bins and scope at the ready we made our way carefully up into the dunes which shielded us from the birds on the lake. On a sandbank we saw a Steppe Eagle tearing away at a fresh kill, and amongst the flock of 80 flamingos were a couple of African spoonbills. There were a vast number and variety of waders on the Khor, and shrike and pipits amongst the dunes, some of which we identified as olive backed pipits. This was a fantastic site. We did a trip round to the other side of the Khor and I filmed the flamingos in flight. By the time we left it was getting warmer but still quite bearable. The next stop at 23km up the road was wadi Garm. The wadi was dry, and it was getting rather hot but we made our way over to the isolated palm groves and picked out a couple of Shrike, also we'd spooked a couple of raptors on our arrival. Next side trip was off to Ras Madrakah. This area was mountainous in contrast to the flat sandy plains we had been through. It seems that further south the mountainous high ground was about 10km inland, but now the hills were close to the sea, and at Ras Madrakah there were rocky headlands and islands. The village itself was in a bit of a mess because of all the heavy road building machinery working on the new blacktop road. At this time the road had been surfaced all the way from the coast road, and only the last kilometre or two to the village were still to be completed. We toured the village with the fisherman's shacks contrasting with the modern power plant and government buildings. There is a track leading though the rocky headland which takes you to three or more small coves which were the domain of the local fishing community. Each sandy cove had a rocky backdrop and the usual shelter on the beach. We had our lunch in the shade of one of the shelters and chatted to an old fisherman who came over to see what we were doing. We thought there was supposed to be a shipwreck in one of the coves and thought that we had discussed this with the fisherman, but it turned out that it was in a different area altogether. We also tried to find out if there was an ice factory in the village, and again we thought we had reliable directions from the fisherman, but we never did manage to find it. We drove back to the main coastal highway and continued onto Duqm having topped up with petrol on the way and bought some supplies in the village. There were some naughty boys in the shop giving Liz a hard time and a chap trying to cadge a lift from me. Unfortunately for him he wanted to go in the other direction. We made our way along the graded track to the beach where there were large numbers of gulls presumably attracted by the fish processing factory situated here. We drove into the fish factory and were given the VIP treatment from the manager and his staff. They were pleased to give us a large bag of crushed ice for which they refused payment. The manager who spoke good English explained that they processed the catch from local fishermen and then this was sent by truck to the north. It was now time to find a camp site, and we searched for the place on the cliffs described in the book. We managed to find the rubbish tip complete with pack of wild dogs, and the army parade ground, but not the site described. We spooked a few gazelle, and then found a track leading to some low gravel hills which gave us some seclusion from the road. This turned out to be a very comfortable site, and when we climbed up the adjacent rocky outcrop we found an ideal viewpoint to watch three gazelles wandering across the plain, totally oblivious to us. I managed to get some good photos of these through the telescope. We finished a perfect day with the usual glass of red to wash down our ravioli and tomato sauce. Broke camp at 8:30 am and made our way back to the main road. We took the southern half of the coastal access track and found the road that we should probably have taken to get to the cliffs. We took another detour to Ras Sidirah. The road went through low rocky hills and small settlements consisting of neat barasti houses. We stopped by a tree where there was the carcase of a fox hanging grotesquely. Presumably he'd been stealing chickens from the villagers. The road eventually reached the rocky coastline and passed through a cove busy with fishermen. We went a bit further and then walked along the beach training our binoculars on the many waders along the shoreline, and the striking limestone island just offshore. Back on the main road we came across a lush oasis with thick vegetation and a lot of water that sprung from the limestone rocks beside the road. Here there were many sand grouse which having been disturbed by our arrival flew round and round looking for a safe place to land. We continued north and turned off towards Shanna via Hayy which was quite a busy place with a petrol station, and a large school. We saw pickups full of schoolchildren on their way to Hayy. On the way to Shanna we picked up a couple of lads on their way home to Masirah Island. They didn't speak very much, and couldn't speak much English. The road passed over a vast expanse of sabkha on a raised causeway. Much of the sabkha was flooded and the water coloured a deep pink presumably by some sort of algae flourishing in the stagnant water. The edges of these great lakes of water were fringed with salt crystals lightly stained by the same pink algae, giving a rather surreal, alien feel to the place. This large area of sabkha is known as Bar Al Hickman. As we dropped the lads off, the ferry was just about full and getting ready to leave. One of the crew, thinking that we were wanting to board started guiding us up the ramp and onto the ferry. We'd already decided not to go over to the island, but we took this as a sign that we were in fact supposed to go, so after a quick discussion we decided to climb the ramp and nestle our car in amongst the assorted trucks and Landcruisers. Very soon after we'd boarded, the ramp was raised and we were off. The vehicles were packed close together and rather than fight our way through to the top deck we found it more comfortable to just stay in the car starting the engine every now and then so that we could cool down. The journey took about 90 minutes. We left Shanna at 12:45 and arrived at Hilf on the island by 14:15. The cost for the one-way 20km trip was 10 OR. On disembarking we made our way to one of the three petrol stations in Hilf. As usual, Shell, BP, and Maha, were all represented. We also topped up on bread and drinks at a local store. Our plan was to make for the bird-rich mud flats at Sur Masirah on the west coast. We stopped briefly at the orchard next to the sewage farm and feasted our eyes on the large number of migrants in amongst the trees. We failed to find our way onto the track running along the west coast that would lead us directly to Sur Masirah, finding ourselves instead, on the east coast. It didn't seem to matter, because the map showed a track leading across the slim waist of the island from Hikl in east to Sur Masirah in the west. The road soon deteriorated into a severely rutted track. The corrugations were very deep, leaving a choice between travelling at 15km/hr or 80km/hr, anything in between would have shaken us and the car to pieces. Travelling at the faster speed, was reasonably comfortable, but made braking or negotiating bends almost impossible. If you knew the road well then you could probably maintain the speed but we were forced to slow down to a snails pace more often than not. Then to make matters worse there were long stretches where the beach sand had swamped the road and we had to negotiate kilometres of soft wind blown sand. Unsurprisingly we saw very few other vehicles. I think if we'd known the area well we could have avoided some of the worst bits by driving along the beach. We eventually reached Hikl but couldn't, at first, find the track crossing the island. We eventually picked up a worryingly faint track with daylight fading fast. With finger crossed, and the GPS showing us the way, we eventually picked our way across the island but emerged on the west coast about 10km south of Sur Masirah. We gritted our teeth and bumped our way along the corrugations and just as the light faded, we found a camp in the rocky headland just before the village. It'd taken us three hours to cover the 56km! The camp was well placed to view the mudflats and watch the sunset. Frustratingly we could hear the birds but it was too dark to see them. We had chilli dogs and chilli sauce in Arabic bread for dinner. The night was quite warm but we got sufficient sleep, and after breakfast we squeezed in an expedition down to the mudflats to watch the birds. I wanted to get off as early a possible because I was unsure how long it would take to return to the ferry on the unfamiliar west coast road. The ferries run for only a couple of hours either side of high-tide, and we couldn't find such a thing as a timetable. We couldn't wait for our tent, soaking wet with the morning dew, to dry, so were forced to pack it wet and finally managed to get on our way by 7:30am. In the event, the road on this side of the island was far better, and we made the 32km trip back to the sewage farm in 45minutes, including a stop on a headland where two Egyptian vultures were looking for their next meal. We got permission from the sewage farm caretaker to take a look at the numerous birds wading in the sewage ponds. A nice pair of Glossy Ibis were strutting their stuff along with some Curlew Sandpipers, Black-winged Stilts, and a host of other waders making the most of this oasis in a very barren landscape. We soon had to drag ourselves away, having promised the caretaker that we'd only stay on the site for half an hour. We continued into Hilf, and boarded the ferry at 9:30am. We were early, but decided that it would give us more time to do a bit of exploring on our journey northward. The ferry eventually set sail at 10:20am. There is very little adherence to a timetable, and the boats just seem to leave when the crew feel they've got enough vehicles on board. Our ferry was only about half full, whereas the one the previous day had been almost completely full. During the journey a very confused Nightjar landed on the gunwales of the ship and then tried to find some shelter under a sheet of wood leaning against a wall. It wasn't happy with what it found and continued on its way. We arrived on the mainland at midday and made our way back to the main highway via Hayy. On the way I just had to stop and photograph the pink lagoons on either side of the causeway across the sabkha. With the right light this is an amazing sight. Having filled up with petrol at Hayy, Liz guided us on a side trip south to Film, where we found a small fishing community of barasti huts, a power / desalination plant, two camels chewing cardboard, and some amazing mudflats dissected by creeks, alive with shore-birds. The small rocky outcrops gave us good cover to quietly observe the birds going about their business. Nice close views of Crab Plover and Curlew here. We'd intended to re-join the main highway via a southern loop track, but as we wanted to try to book a motel room in Nizwa, and hadn't managed to find a phone anywhere, we decided to return the way we'd come via Hayy. We found our way back onto the main road going north to Sinaw. A quick stop at another petrol station in search of a telephone was unsuccessful. Eventually we found a phone in Sinaw. While I filled up with petrol again, Liz called the Falaj Al Daris in Nizwa, and managed to book a room. Just before we reached Izki we hit a brand new highway which took us directly to Nizwa, in time for a quick shower and dip in the pool before the sun went down. Then it was time for a drink in the bar, which is now very plush, and then a well earned meal in the restaurant, which I think could do with a good makeover. There was a tour group of Germans staying, but otherwise the place was fairly quiet. Got up at 7am the next morning, and had breakfast by the pool, although I don't think we were supposed to, judging by the disapproving looks we got from the rather dour waiters, and the disappointment on the faces of the Germans who were told to have their breakfast in the dining room. Never mind, it was a very pleasant place to have breakfast. Checked out at 8:30 paying 52 OR (29 for the room). We stopped at the Nizwa supermarket so that Liz could stock up with her favourite citrus Fanta, and then made a detour to the Bee-hive tombs at Al Ayn, near Jebel Misht. Had a puncture in the wadi and had to change the wheel in the midday sun. Managed to get a tube put into the tyre in a repair shop in the small sleepy village of Bat (charged 4 OR but felt generous and gave him 5), and then made our way to Ibri where we again filled up with petrol and took the time to explore the fort which we've passed so many times without stopping. It was just after Friday prayers and the nearby mosque was emptying out as we arrived. We enjoyed a good poke around this fantastic fort built on sloping ground on a small jebel. The steep sides of the jebel give extra natural protection to the enclosure. We climbed up to the top, took some photos and I wondered when it had last been inhabited and what events must have taken place on this site. I had fun working out how they'd channelled the rain water through the main-street inside the walls and out to the cisterns in front of the main entrance. Some of the buildings within the fort walls were remarkably intact considering they were built of mud-bricks. One room, which I took to be a bedroom had a well preserved, brightly decorated ceiling and although it was very hot outside the wind-tower effect made the temperature in there much lower. Soon we were back on the road and approaching the Mezyad border again, where we said 'au revoir' to Oman. We completed the border formalities in about 15 minutes and after a trouble- free journey from Al Ain we arrived home at 17:30. It had been a fantastic journey, and we had seen and done so much. We spent the last part of the journey back to Abu Dhabi discussing when we could make a return trip and what we still wanted to see.